Hathersage to Grindleford Light Flow, part of the Derwent Pulse project, will take place on Tuesday 14th October, 5.00 to 6.30pm. As you already know, Derwent Pulse is a Derwent Valley Mill World Heritage Site project commissioned by Derbyshire based artist Charles Monkhouse. It involves a light flow the length of the River Derwent that explores the river and its heritage. Each passage of lights will be shepherded by local schools and riverside communities. Ramblers and walkers navigate the lights through the mountains, and schools form an electric parade along the river. As part of the Charting the Future element of the project, the children from Grindleford Primary School worked with textile artist Judy Hawdon, exploring the river, its environment and history, resulting in a large scale paper based map of the river. This art work will form part of a bigger, 6m piece, contributed by other schools and communities. 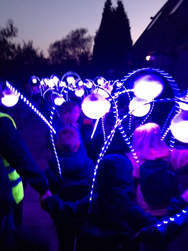 The children will Shepherd the lights along the stretch of river from Leadmill Bridge, Hathersage to Grindleford playing fields, wearing specially commission LED costumes. The image below is of the trial run of the light suits. Images of the light flow, documented by a team of photographers and incorporated in a Legacy Screen, will be exhibited with Derwent Chart in Derby’s Silk Mill. The archived website will provide a digital record of the entire project. The still pulsating lights will be distributed to industrial world heritage sites, which echo the history of the Derwent Valley. If you would like to take part in the Shepherding the Lights parade next Tuesday evening, you need to be at the Leadmill Bridge in Hathersage for 5pm. David Mellor have very kindly said that our parents can leave their cars in their car park to avoid having to park on the roadside. At Leadmill Bridge we will put on the light suits (as shown above) and gather the spheres that are being carried. The older children will get first dibs on the light suits. The spheres will then be walked along to the Sheep Field, crossed over at St Helens and back across the road to the Pavilion. We should arrive at the Pavilion for 6.30pm. Due to the nature of the event all children will need to be accompanied by an adult for safety reasons. However, it should be a really exciting evening and one that everyone will thoroughly enjoy, so the more extended family members that you want to invite the better! If you don’t fancy walking all the way from Hathersage (or think little legs won’t manage it) then feel free to walk the path from Grindleford to join up with us or just meet us at the Pavilion. For safety, I need to gather as accurate numbers as possible so please pop in and put your name down, ring up, comment on here or leave a message on the answer phone asap! Thank you! Posted on October 9, 2014, in General Information. Bookmark the permalink. 6 Comments. The Seligmans will be there… 2 adults (possibly 3) and 2 children. Sounds great! And could we bring a dog?! Two adults (possibly three depending on work commitments) and one child please – really looking forward to it! Platts will be there also 2 adults (poss 3) and both children. Two adults and two children please – sounds great! Ella, Hugh and myself will do the walk, for sure.